Successfully Added 4 Channel Mini HD NVR "Box-Watch" - ONVIF, Cloud P2P, 1080p/960p/720p, E-SATA HDD Connection to your Shopping Cart. 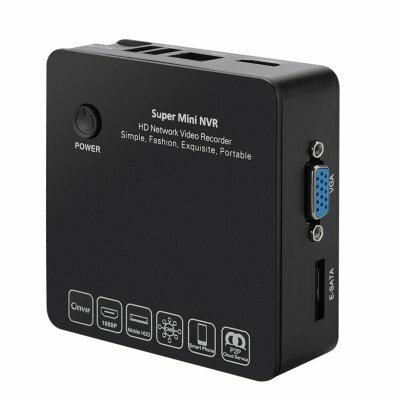 This ONVIF compliant compact mini HD network video record has 4 channels for and provides an easy way to maintain top notch security as it supports Cloud P2P, 1080p/960p/720p and E-SATA HDD Connection. This attractive mini NVR is so compact you could slip it in your coat pocket. Taking up hardly any room the “Box-Watch” can support up to 4 individual feeds from separate IP cameras and being OMNIFV compliant its compatible with a huge range of main cameras including major brands like Honeywell, Sanyo, BOSH, WISION, Samsung to name but a few. 1080p, 960p and 720p are all supported so you get top quality images for your recordings and during playback. Choose the option that's right for you with selections for two 1920x1080 and two 1280x720 IP cameras or four 1280x960 IP cameras. With mobile surveillance options and Cloud P2P function you can use your Smartphone or a computer to keep tabs on what the cameras are picking up and its discreet size let it be setup almost anywhere. With 2 USB ports, VGA, Micro USB, HDMI, LAN and an E-SATA port there could be no easier way to hook up this mini NVR to your existing system or create a new surveillance system from scratch. Buy yourself peace of mind and excellent security with this state of the art mini NVR. The "Box-Watch" NVR IS Now in stock and comes with a 12 months warranty. Brought to you by the leader in wholesale NVRs, Chinavasion.